Should Women Shave Their Face – What Experts Say? The growth of facial may vary from one woman to other. In some women facial hair may be fine or negligible. But some others may have dense and thick hair on their face. But is it good to shave facial hair in women? There is nothing new about shaving the facial hair. Famous personalities like Cleopatra, Marilyn Monroe and Elizabeth Taylor are famous for shaving their face. They were known for their beautiful and flawless skin. They treasured their razors. This topic was discussed on Today.com and according to the discussion most of the beauty experts are of the opinion that you can shave your face. The myth that your facial hair will become coarser and the hair will grow fast once you start shaving your hair, is not correct. By shaving your facial hair you can not only get rid of the hairs on your face, but also remove dead skin cells that are deeply layered. This helps in making your skin look fresh as well as smoother and brighter. By removing the dead skin cells it becomes easy for the beauty products to penetrate deep into the skin and reduce the growth of facial hair. Shaving is also great for exfoliating your skin and to slow down the process of aging. But if you have very coarse or thick hair, then there is the chance of getting bumps. These bumps may get punctured with the growth of new hair. However, the chances are very rare. One of the benefits of shaving over laser treatment and waxing is that the latter two cause irritation to your skin. They also do not remove the peach fuzz. Moreover, these methods are very costly. All these make shaven a better option. To make you accept the concept of shaving, various beauty bloggers such as Hunda Kattan have introduced video of them shaving their facial hair. They explain how the technique can help you get smooth skin. It also helps in enhancing your makeup. First of all you have to wet your face to soften hairs. It is also important that you clean your face before shaving. A clean face is important because if there is dirt present on your skin, there are chances of breakouts. Once you have cleaned your face, you can apply a cream or gel shaving cream all over you face. The gel or the cream will help in preventing friction, thereby keeping your skin from getting irritated. Now use your razor in the direction of your hair growth for a subtle shave. If you want an even closer shave, then you can move the razor against the growth of hair. When you take the razor to your face, support the skin by pulling it slightly taut and then shave. Once you have shaved off the hairs, you can rinse your face and apply a good quality moisturizer on your face. For sanitary purpose, make sure that you wash your razor every time you use it. After every use you should dip the razor in 90 percent rubbing alcohol. Shaving dry will cause less re-growth. But you have to have the right equipments for it and prepare your skin properly. If you need lubrication, natural aromatherapy facial oils are there in men’s ranges. If they don’t have alcohol in them, then they are suitable for women as they will not mess with the pH level of your skin. Your hair will not grow back thicker after shaving. It is just a myth. Shaving has no effect on the rate of hair re-growth, colour or texture. Always shave in the direction of hair growth and remember to do it slowly. You should not use the razor you use for your face to remove hairs from any other parts of the body. This way you can avoid skin irritation and infection. Remember to keep your razor clean. If shaving the face is done the correct way, shaving will cause you very little irritation on the skin. All you have to take care is to moisten your face and apply soap or shaving gel. Then use a razor with sharp blade. It takes much less time to shave your face compared to waxing or laser hair removal. It is one of the best solutions when you have to go on a sudden date or occasion. Shaving makes your skin smooth by removing dead skin cells. This way the makeup slides on easier and look s better. A razor can remove the finer, light collared downy strands called vellus hair, known as the baby hair, while waxing cannot do so. 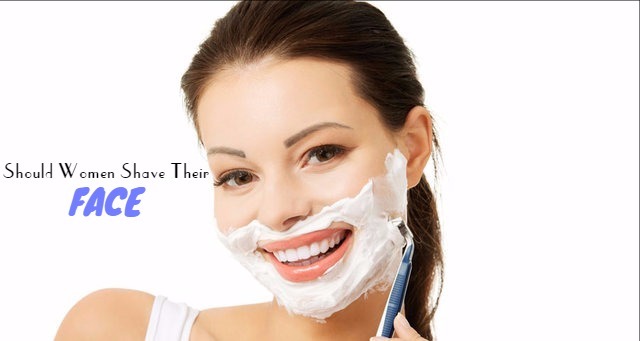 Shaving also has anti-aging effect on your skin. This is because shaving is like a mild microdermabrasion. This helps in increasing collagen production. As a result, the appearance of wrinkles on your face is reduced. Whenever there is trauma to the skin, collagen production increases to renew the cells. The hair will not grow back thicker after shaving. The razor that men use for shaving their face may not suit a woman. So, do not take men’s razor for shaving your face. You can use Gillette Venus. This is a specially designed razor for women. Using this you can remove facial hair effectively. While some say shaving is a good option, others say that you can adopt other means to remove hair. So, it is up to you whether you want to shave your face or not.